The Rocks will again play host to Sydney’s St Patrick’s Day festivities in 2020, the Irish Echo has learned. 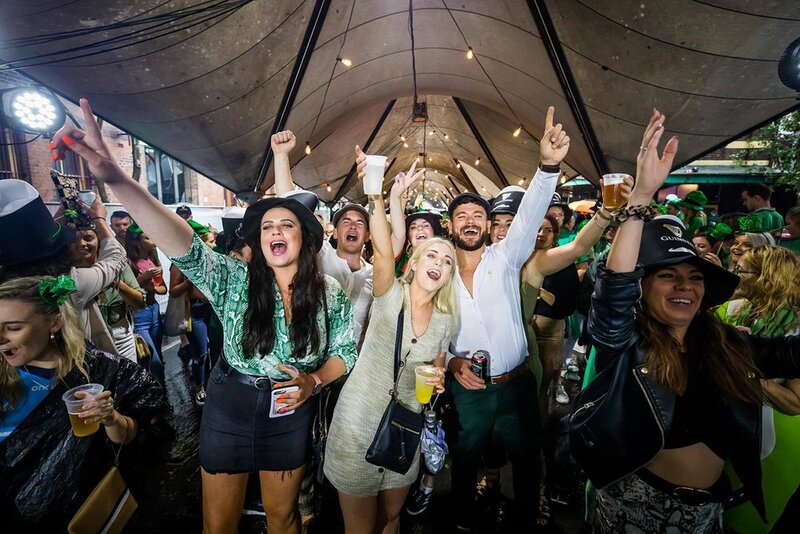 Despite more than 44mm of rain on St Patrick’s Day, thousands of revellers made their way to The Rocks for the official Irish celebrations. The determination of the Irish community to celebrate the national day despite the appalling weather impressed Property NSW, who manage The Rocks area. “Our vision to transform The Rocks into an Irish village was a great success, with our restaurants, bars and retailers, and the Sydney St Patrick’s Day Parade and Festival organisers worked hard to ensure visitors had the best experience possible, despite the weather,” spokeswoman Sarah Cleggett told the Irish Echo. More than 600 people took part in the modified parade, which weaved its way through the narrow streets of The Rocks. Outside the Mercantile Hotel hundreds of revellers enjoying the live music cheered on the parade as it made its way up to Dawes Point Park, the festival site. Karen Murphy, president of the Sydney Saint Patrick’s Day Parade and Festival committee, was delighted that so many turned up to celebrate, despite the downpour. Large crowds made their way to The Rocks on St Patrick’s Day despite the downpour. “The Sydney St Patrick’ Day Organisation volunteers would like to thank the Irish, friends of the Irish and those who were Irish for the day who braved the rain, walked with the parade, splashed in the puddles and demonstrated that hail, rain or shine nothing stops the celebrations on St Patrick’s Day. We are so proud of you. The rain eventually took its toll on the festival site at Dawes Point Park, which closed early, at 2pm. The decision to go ahead with the volunteer-run event resulted in a big financial hot for organisers who are appealing for financial support from the community. 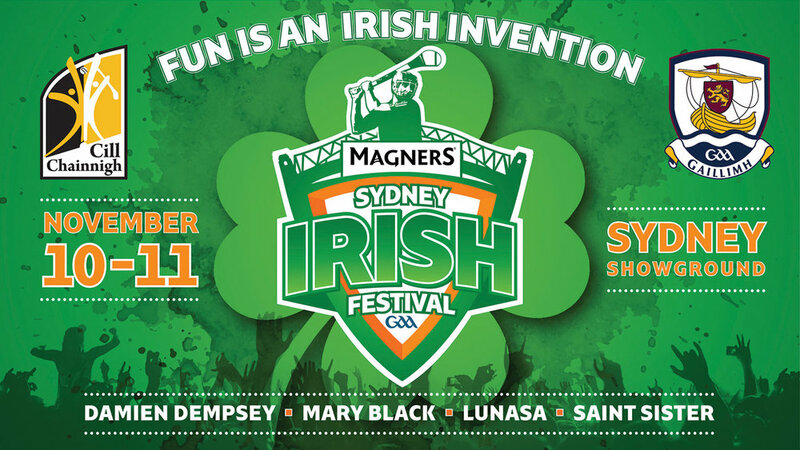 An ad for last November’s Sydney irish Festival which ran into problems over poor ticket sales. The widely-criticised Sydney Irish Festival, which took place in November, is now part of a legal claim against the GAA. The manufacturer of Bulmers is suing the GAA in Ireland’s High Court, claiming it reneged on a deal to put the cider brand on tap in Croke Park, according to The Times. In its action Bulmers, owned by C&C Group, is claiming it had an agreement for “pouring rights” in GAA headquarters. But the liquor company also wants to recover sponsorship money it claims it is owed relating to the Sydney Irish Festival, a GAA event in Australia last November, because the event did not go ahead in the way it had been presented to the cider company. It is understood that C&C Group believed that sponsorship of the festival was linked to securing “pouring rights” in Croke Park. The two-day festival in Sydney, which was sponsored by Magners, as Bulmers is known in Australia, was reduced to a one-day event due to lower than expected ticket sales. Held in the Sydney Showground, the festival included a hurling match on November 11 between league champions Kilkenny and Galway, the All-Ireland champions of 2017. Plans for a “family fun day” on November 10, featuring hurling clinics, amusement rides, player autograph sessions, activities for kids and a Guinness World Records attempt to make the world’s biggest Irish stew, were all cancelled just five days before the event. Galway revellers at the ill-fated Sydney Irish Festival. Well-known ballad singer Mary Black, urban folk performer Damien Dempsey, electro-folk outfit Saint Sister and enduringly popular trad band Lúnasa had been scheduled to perform on the first day of the weekend festival. The announcement of the change was met with disappointment and rancour, especially from those who had booked travel from other states and/or time off work. The late change left them out of pocket on air fares and accommodation. Many patrons who attended the event were quick to criticise the organisation of the day with long queues for the bars. When some reached the top of a long queue, they were further frustrated to find out they could only get two drinks per person. Paul Sergeant of Paul Sergeant Events, who was the local organiser of the festival, told The Irish Echo that the hurling had been a huge success but “we were deeply disappointed that we had to make the difficult decision to cancel the Saturday events and we apologise for the inconvenience it will have caused. “There has been plenty of positive feedback about the day but it was spoilt for some by their experience at the bars. The venue operator has to adhere by RSA [responsible service of alcohol] requirements specific to every event, hence the drinks limit and bar closure times,” Paul Sergeant said. Paddyfest at Eagle Farm Racecourse is one of a range of St Patrick’s Day events planned for Brisbane. The Irish will march through Brisbane city for the 30th time this year in a parade that begins and ends outside the city’s Botanic Gardens. The event attracted more than 30,000 onlookers last year as the city’s GAA teams, Irish groups and dancing academies presented their colourful floats or took part in walking groups. The parade starts at 10.30am on Saturday March 16 but there will be stalls and entertainment both before the parade as people congregate and afterwards when everyone returns after the parade. Saturday March 16 is also the date for Paddyfest at Eagle Farm Racecourse where the full day of entertainment will include indie rock four piece Kingswood; Brisbane-based Tullamore Tree; Tartan Shamrock who go between traditional Irish and classic Aussie rock; singer-songwriter Shanon Watkins; City of Brisbane Pipe Band; Walker’s Irish Dancers and Leprechaun DJ. The programme will also include entertainment for kids of all ages, including a petting zoo, and at 7pm, the festival will wow with a big Irish-themed laser, lights and live DJ spectacular. This epic show will be a huge hit with the kids so be sure to stick around for the show! The build up to Brisbane’s St Patrick’s Day festivities begins well before the big weekend with the Brisbane Irish Festival Ball taking place at the Hilton Hotel in the city on March 9. Hosted by the Irish Australian Support Association of Queensland, this is a fundraising event for the association as well as a celebration. Some lucky person will win $15,000 worth of gold bullion in the Luck of the Irish Art Union. The Queensland Gaelic Football and Hurling Association hold its Family Fun Day on March 10 at Gaelic Park, Willawong. Admission is free for children and among the entertainment on offer will be novelty races, live Irish music, Queensland Irish Association Pipe Band, Irish dancing, Gaelic sports exhibitions, tug-o-war as well as a licensed bar and food available all day. The Irish Australian Chamber of Commerce will hold its St Patrick’s corporate lunch at the Sky Room on March 15 from 12pm. Hosted by well-known Brisbane journalist and Walkley Award winner, Patrick Condren, Dublin comedian Ian Coppinger will provide the laughs. Anyone who wants to see some elite Irish dancing accompanied by ballads can seek out the touring Heart of Ireland show which plays Nambour on March 15, The Star on the Gold Coast on St, Patricks’ eve, March 16 and Chermside in Brisbane on St. Patrick’s Day itself. Choreographed by a two time world champion dancer, every member of the Heart of Ireland troupe is a world championship finalist. The city’s Irish pubs are also planning major celebartions. 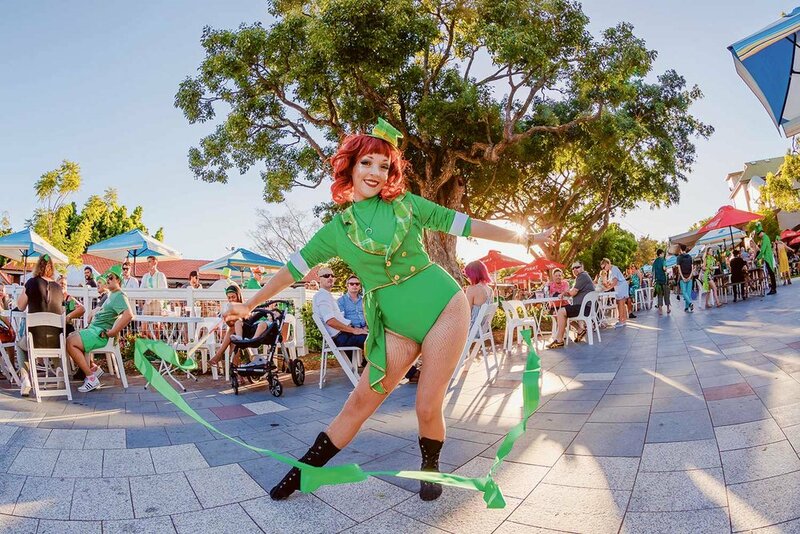 Finn McCool’s Irish bar in Fortitude Valley takes over Brunswick Street Mall on St Patrick’s Day with an extended licensed area and live entertainment that includes Barley Shakes, The Gathering, The Munster Bucks, Queensland Irish Pipe Band, Limerick and Scoil Ard Rince Irish dancers. (Clockwise from left) Loretta Cosgrove, President of Sydney Queer Irish, Owen Feeney, Consul General of Ireland, Lorna Hennessy and special guest Panti Bliss. Dozens of revellers donned pink and green as part of the Queer Irish entry for this year’s gay and lesbian Mardi Gras in Sydney. This year, the group celebrated “a history of fearlessness in the Irish people that has led us to a more inclusive Ireland”, according to Sydney Queer Irish president Loretta Cosgrove. “It was a long day starting at 12pm at the Gaelic Club to get our marchers glittered and into costume for some final rehearsals,” Cosgrove said. Irish revellers at the Sydney Mardi Gras. Bright, life sized lantern puppets representing the four provinces of Ireland joined SQI marchers in neon green and pink for the parade in an entry they dubbed Solas, the Irish word for light, which symbolised “Irish peoples’ fearlessness and courage to make positive change”. The so-called “Queen of Ireland” Panti Bliss added some celebrity sparkle to the Irish entry. Established in 2010, Sydney Queer Irish (SQI) is a community-based organization supporting the Irish and Irish Australian LGBTI community through a variety of events and support networks. The four provinces join the Sydney Gay and Lesbian Mardi Gras. The Rocks area of Sydney will host Sydney’s official St Patrick’s Day celebrations. 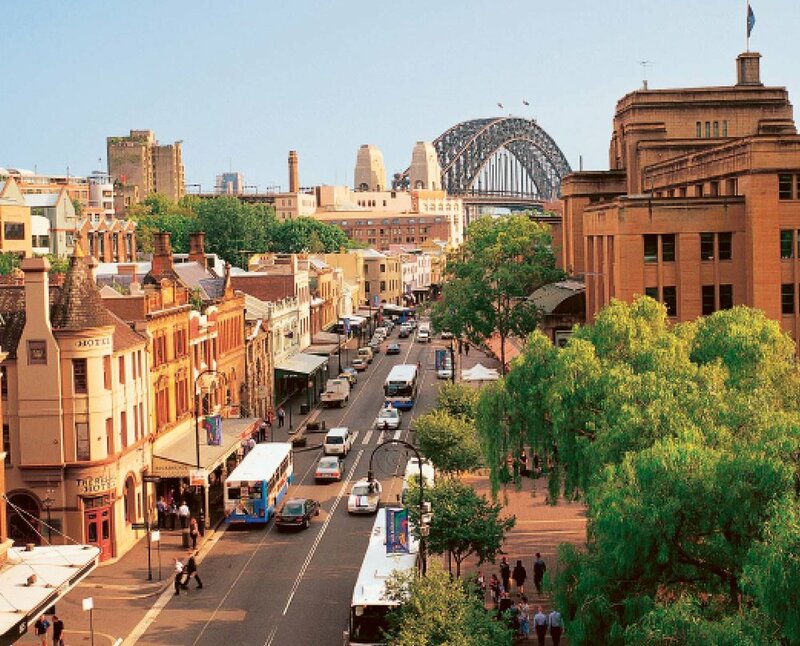 The Rocks area of Sydney will be the centrepiece of the city’s St Patrick’s Day celebrations. The Saint Patrick’s Day Festival, with the theme Back to Our Roots, will kick off with a walking parade through the area on Sunday, March 17, reminiscent of the first Irish community parade. The parade will kick off at 11am from First Fleet Park and will make its way through the historic area finishing at Dawes Park. The parade will be family focused, an event spokeswoman, Mary Doherty, said. The map of the St Patricks Day Parade route for Sunday, March 17. “Already applications have been coming in from local dancing schools, mothers groups and sporting clubs. Groups or individuals who want to join the parade can still submit an application on the Sydney Saint Patrick’s Day Festival website,” she said. The celebration will include a day-long program of activities at Dawes Park starting at 11.30am. “This year’s festival has something for everyone, young and not so young, Irish, non-Irish and those who just want to join in the craic,” Ms Doherty said. “As always music will be at the centre of the celebrations and this year’s line-up is fantastic. “There will be live music from favourites such as Strawberries and Cabbage, Blackwater, Chris Harper and The Bottlers and plenty of up and coming acts in the form of buskers and street artists. Approximately 50 Irish nationals will become citizens at a special citizenship ceremony on the day. A large licensed bar and various stalls will offer everything from food and drinks, to crafts. The party extends from Dawes Park with the entire Rocks area transforming into an Irish village for the day. To add to the celebration, the sails of the Sydney Opera House will be illuminated in green as part of Tourism Ireland’s Global Greening project. The layout for the family celebration at Dawes Point Reserve. The Mercantile Hotel, the iconic Irish pub in The Rocks, will be offering a full Irish breakfast from 7.30am on the day, plus live entertainment. The Sydney Irish business community will celebrate St Patrick’s Day on Friday March 15. More than 1,000 revellers are expected at the Lansdowne Club’s annual St Patrick’s Day Lunch at the International Convention Centre with special guest Heather Humphreys TD, Ireland’s Minister for Business, Enterprise and Innovation. Earlier in the day, the Irish Australian Chamber of Commerce will host a St Patrick’s business breakfast at Doltone House at Hyde Park. Expat nurses send a powerful message to the irish government from the steps of the Sydney Opera House. More than 250 Irish nurses gathered at the Sydney Opera House on January 20 with a simple message for the Irish Government: ‘Give us a reason to come home’. The nurses gathered to show solidarity with their colleagues, nurses and midwives, at home who are campaigning for better working conditions in Ireland. The protest was replicated in Melbourne and Perth as well as London, Saudi Arabia and Doha . 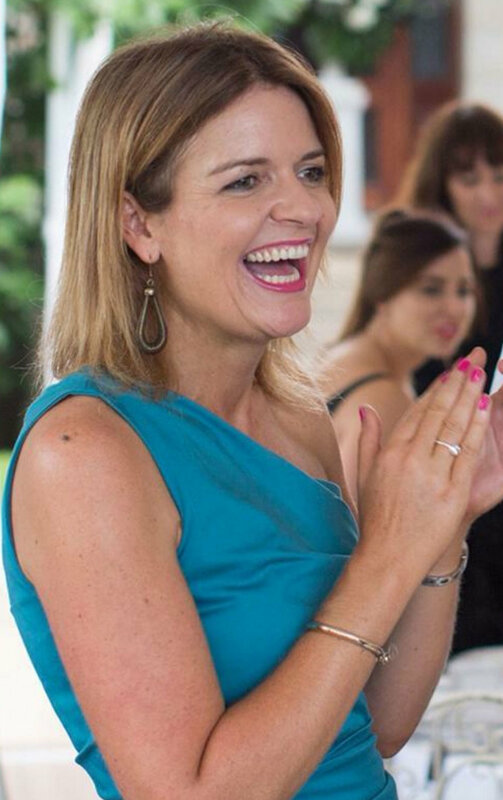 Laura Phillips, a Dublin nurse who organised the Sydney protest, said she had been overwhelmed by her colleagues’ support. “It’s a support message. We can’t be there at home; we’re across the world for the reasons that they’re striking. We can’t be there to show our support so we thought we would send that message and also send a message to the government. There are nurses here who want the option to come home but won’t. They refuse to work for the pay scale that’s being offered,” she said. Laura explains that nursing in Ireland left her burnt-out and completely frustrated while she was earning only €30,000 a year. Since relocating to Australia, not only does she earn nearly double, earning $90,000 (€57,000), but conditions are better with a strict ratio of four patients to one nurse. “I was trained to a really high standard but I wasn’t able to bring the highest standard to the bedside because the time wasn’t there. It’s impossible when you’ve got a patient load of six to eight patients along with other terrible working conditions. Irish nurses Helen McEnery, Niamh Burns, Laura Phillips and Sorcha Sharkey in Sydney to show their support for their colleagues in Ireland who have taken industrial action for better working conditions. Ireland will continue to lose good nurses to Australia and other countries if the issues at the heart of the strikes are not addressed, she claimed. “It’s sad to see because we are trained to a really high level in Ireland on the taxpayers’ money and then the other health systems reap the rewards. That’s the reality of it. That’s why there’s been such a response to this support message. “I know nurses who want to go home. Some have gone home and actually came back out because they couldn’t do it, they couldn’t work in the conditions and be paid that. It’s not a reflection on our skills, our high qualifications. “Every other public sector job is paid better than us. The general public have been fantastic in terms of support. These are people who receive the care, see the constraints of the health system. These are families, parents, relatives. The question that has been asked time and again is, ‘how does extra money in a nurse’s pocket help the health service?’ It’s just where it starts. They have a massive recruitment issue and retainage (sic) issue. Nurses won’t work for what they’re being offered. Irish nurses at Federation Square in Melbourne. More than 30,000 Irish nurses and midwives have been taking industrial action in a bid to bring the government to the negotiating table. Urgent surgery and critical care were not affected but about 13,000 outpatient appointments and 2,000 planned procedures were cancelled. Emergency departments operated but with fewer nurses. It was INMO’s first strike in 20 years. A planned three-day strike earlier this week was called off after the Labour Court intervened with a proposal to improve nurses wages and conditions. The Irish Echo spoke to another Irish nurse who did not want to be named but was also at the Sydney protest. The nurse from Galway told The Irish Echo: “I think we all got a little bit emotional. It’s quite sad to think that 10 of our year of 50 (student nurses) are left at home and we’re all leaving for the same reason. “They try to do these incentives to bring us home but not one person I talked to wants to go back to the Irish health system with the way we were treated. “I think we’re a third world country at home compared to the way we work out here. “The care at home is second to none but that’s because the nurses are brilliant but we’re just not treated the way that we’re treated out here. Christopher McLaughlin (L) and Nathan Kelly have been charged with murder. Two Irishmen have been charged with murder following the death of a 66-year-old man in Sydney. The two men, both from Donegal, were originally charged with “affray” and “reckless grievous bodily harm in company” following the December 29 incident. But the charges were upgraded to murder following the death of victim Paul Tavelardis on Monday. Christopher McLaughlin, 24, and Nathan Kelly, 21, appeared in court today via video-link from separate prisons. The defendants will remain in custody after the judge refused them bail. They are due to appear in court again on March 6. Kelly fronted Burwood Local Court on Wednesday via video link from Silverwater prison. McLaughlin, who is understood to be a tunnel worker for WestConnex, also appeared via video link from Long Bay jail. Meanwhile the family of Mr Tavelardis have paid tribute to the grandfather-of-nine who was battling leukemia. “He loved to travel, that was his indigenous side, he loved to go, as we say, ‘walkabout’,” his son Bradley Tavelardis told The Daily Telegraph. Bradley Tavelardis said his father was a peaceful man, did not smoke or drink, and “lived every moment” due to his illness. Mr Tavelardis jnr said he held no ill-feeling towards the families of the two men who had made contact with them from Ireland. “The families of the two boys, they would be going through a lot of hardship as well,” he told the Daily Telegraph. Christopher McLaughlin (L) and Nathan Kelly remain in custody. Two men from Donegal have been charged following an alleged assault in Sydney. Christopher McLaughlin, 24, and Nathan Kelly, 21, both with addresses in Donegal, were arrested near the scene of the incident in the inner west suburb of Summer Hill. They were taken to Burwood Police Station where they were charged with "reckless grievous bodily harm in company and affray". Police said a 66-year-old man was found on the side of the road at the intersection of Grosvenor Crescent and Liverpool Road, just after midnight local time on Saturday. He was treated at the scene before being taken to Royal Prince Alfred Hospital where he is said to be in a critical condition. Mr McLaughlin from Malin and and Mr Kelly from Glengad appeared before Parramatta Bail Court yesterday. They were both refused bail and are due to appear before Burwood Local Court on January 9. Police said neither Mr McLaughlin or Mr Kelly were known to the injured man.